If there is one thing that we humans ought to know as pet owners, it would be this – cats treat us on a very different plane compared to dogs. Yes sir, this is why dogs are not called man’s best friend for nothing, right? However, there is still a fair number of people who absolutely love cats to the death, having these prowling felines around their home. 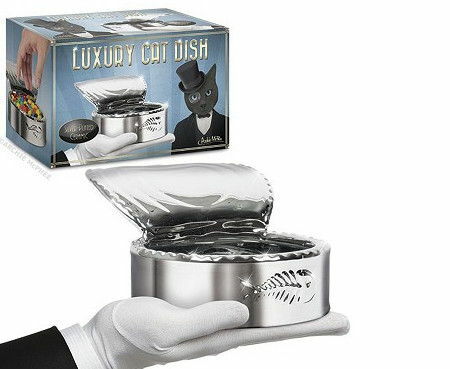 For those who wish to exhibit an even greater amount of dedication and love to their pets, then perhaps it might be prudent to check out this rather expensive looking $18.99 Luxury Cat Dish. The name of it says it all, and you get to spoil your feline friend even further as you pile on salmon chunks into this dish. It is also safe for human use, just in case you were wondering, but we doubt that your cat would want to share it with you.